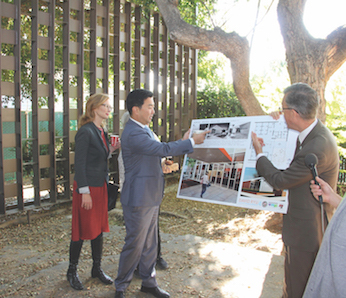 GARDEN COURTYARD is the setting for review of building renderings by Sarah Dusseault, Councilman David Ryu and City Engineer Gary Lee Moore. One year after a November 2017 announcement by Councilman David Ryu and the City of Los Angeles, ground was broken (more accurately, ankle-deep debris was cleaned off the floors) to remodel a former public library building into a facility that will provide 30 beds and services for women experiencing homelessness. The “bridge housing” project on North Gardner Street at De Longpre Avenue (one block south of Sunset Boulevard), will include welcoming outdoor spaces while respecting the Mid-Century Modern building’s International style design by architecture firm Honnold and Rex. The city expects the housing project to be completed by late summer of 2019. The facility also will have offices for case managers who will work with residents to transition them into long-term housing. Renovation work will primarily take place inside the building, with the original façade and exterior trees on the city-owned former library remaining in place. In 2017, more women and children lived on the streets of Los Angeles than in any previous year, and both groups face higher risk of victimization living on the streets or in traditional shelters. Also speaking at the event were City Administrative Officer Rich Llewellyn, City Engineer Gary Lee Moore (whose office will oversee the project), neighbor JoAnn Kaplan, and Ann McCall. Formerly homeless herself for some years, McCall has a master’s degree and now advocates for addressing the local homeless crisis. A frequent question about the Gardner Street building, and similar facilities, is: “Who will run this bridge housing location?” The council office explains that there will be a nonprofit operator that goes through a selection process overseen by LAHSA to ensure that the operator performs in accordance with federal, state, county and city guidelines. LAHSA is an independent government agency that was formed in 1993 by the Los Angeles County Board of Supervisors, the Mayor of Los Angeles and the Los Angeles City Council. LAHSA partners with both the City of Los Angeles and the County of Los Angeles to integrate services and housing opportunities for homeless families and individuals in Los Angeles County.